During the Christmas Season, many of the major Orlando Resorts and Hotels get into the holiday spirit by putting on special events and attractions. 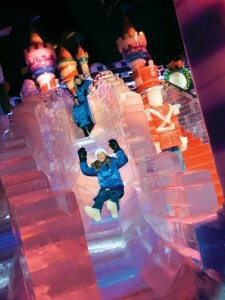 One of the best attractions and most heavily advertised is the Gaylord Palms ICE! attraction in the Kissimmee area just outside Disney World. Each year, the Gaylord Palms resort brings in 40 ice artisans to spend more than 30 days to hand carve out 5,000 blocks of ice that weigh close to 2 million pounds. The theme for the 2013 event features Frosty the Snowman. In addition to the ICE! Event, the Gaylord Palms puts on a Christmas Show on most nights in December with a giant Christmas Tree in the atrium that has dancing lights during the performance. The resort turns into a mini-indoor theme park with Dreamworks Character Meet and Greets and pool parties if the weather is warm enough. On International Drive, several of the Rosen Hotels have Christmas and Holiday events taking place mostly on the weekends with a majority of the larger events taking place at the Rosen Shingle Creek and the Rosen Centre. The Rosen Shingle Creek features holiday ballet shows on the Friday and Saturday Nights in the early part of December from the Elizabeth Parsons School of Dance and Windermere Ballet Community Theatre. Over at the Rosen Centre is an ice skating rink that is on International Drive on December 6th, 7th, and 8th and 13th, 14th, and 15th in 2013. The Grande Lakes Orlando Resort, that comprises of the JW Marriott and Ritz Carlton, has a few holiday events taking place around the holidays including a Gingerbread School. The Hilton and Waldorf Astoria at the Bonnet Creek Resort will have several events at the resort throughout the month of December including Christmas Caroling, visits from Santa Claus, Horse and Carriage Rides, and fireworks.